Passport cameras are designed to take multiple, similar pictures for use on identity cards and passports. Typically they take two or four, but sometimes other numbers of images, on the same piece of film or paper. The design usually incorporates a separate lens for each image, with either one, or connected shutters, and fixed focus lenses, set to focus between 1-2m (3-6ft) - a suitable distance for facial shots. 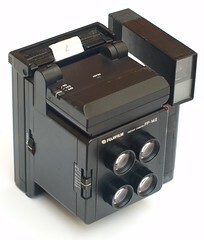 Passport cameras are commonly instant cameras, or use some rapid turn-round process. Without instant processing, passport cameras have no advantage over any other type of camera, since images can be duplicated at the printing stage. Special passport cameras have become redundant with the advent of digital cameras, whose images can simply be printed many times from a computer. See also: list of passport cameras.